Citation Information: J Clin Invest. 2006;116(1):115-124. https://doi.org/10.1172/JCI24335. Expression of Ccr2 and its ligands in lean mice, obese mice, and obese mice treated with pioglitazone. 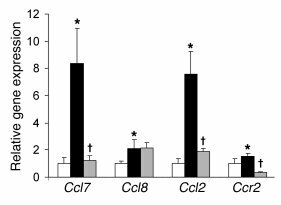 Expression of Ccr2 and genes that encode 3 of its ligands, Ccl2, Ccl7 and Ccl8, were measured in lean mice (white bars), obese mice (black bars), and obese mice treated with the insulin sensitizer pioglitazone (gray bars). *P < 0.05, lean vs. obese; †P < 0.05 obese vs. obese pioglitazone-treated (n = 4). Values are expressed as mean ± SD.